The Ford Escape, a pioneer in the Compact SUV segment when first introduced 16 years ago, features some significant updates for the 2017 model year. Ford Escape has long brought advanced technologies to the road and that tradition continues for third-generation 2017 models. Three engines, including two economical and powerful EcoBoost motors, are available plus the latest driver-assist technologies and wireless connectivity are all part of the 2017 upgrades. For 2017, the Ford Escape SUV is available with three different engine choices. Standard is the 2.5 L i-VCT DOHC four cylinder that delivers 168 horsepower and achieves fuel economy ratings of 11.1 L/100 km city, 8.1 L/100 km hwy.., 9.8 L/100 km combined. * The 2.5 L engine is available only with front wheel drive. Next in line is the 1.5 L turbocharged EcoBoost four-cylinder engine that produces 179 horsepower and fuel economy of 10.2 L/100 km city, 7.8 L/100 km hwy., 9.1 L/100 km combined for the front-wheel drive version. * The smaller 1.5 EcoBoost engine is both more powerful and more economical to drive than the larger 2.5 L normally-aspirated engine. The 1.5 L EcoBoost engine is available with Front-Wheel Drive (FWD) or optional intelligent 4WD. The top-of-the-line motor is the 2.0 L twin-scroll turbocharged EcoBoost four cylinder. The 2.0 L EcoBoost develops 245 horsepower yet delivers even better FWD fuel economy than the base 2.5 L engine, at 10.6 L/100 km city, 8.0 L/100 km hwy.., 9.4 L/100 km combined. * The 2.0 L EcoBoost engine is available with Front-Wheel Drive (FWD) or optional Intelligent 4WD. Properly equipped, the 2.0 L EcoBoost powered 2017 Escape has a maximum towing capacity of 1587 kg. The 2017 Escape SUV is the first Ford vehicle to make Auto Start-Stop Technology standard on both of its two EcoBoost engines. Auto Start-Stop shuts off the engine during common stops, so the vehicle burns no fuel and emits no tailpipe emissions, restarting automatically when the brake pedal is released. All three 2017 Escape engines are fitted with a six-speed automatic transmission with SelectShift capabilities. Every 2017 Ford Escape features a versatile 60/40 split second-row seat standard in all models. By folding down either of the seat backs it creates additional cargo space and you’ll still be able to accommodate one or two rear passengers. Folding down both seat backs provides 1925 L (68 cu. ft.) of cargo space with a flat load floor for easy loading and unloading. There are three trim levels available in the 2017 Escape SUV: S, SE and Titanium. Every model comes with an array of safety features standard, including Safety AdvanceTrac® with Roll Stability Control, Safety Canopy side air-curtain technology for the first and second rows, SOS Post-Crash Alert System, and MyKey programmable vehicle key. Technology Package on SE models, and is standard on Titanium models. 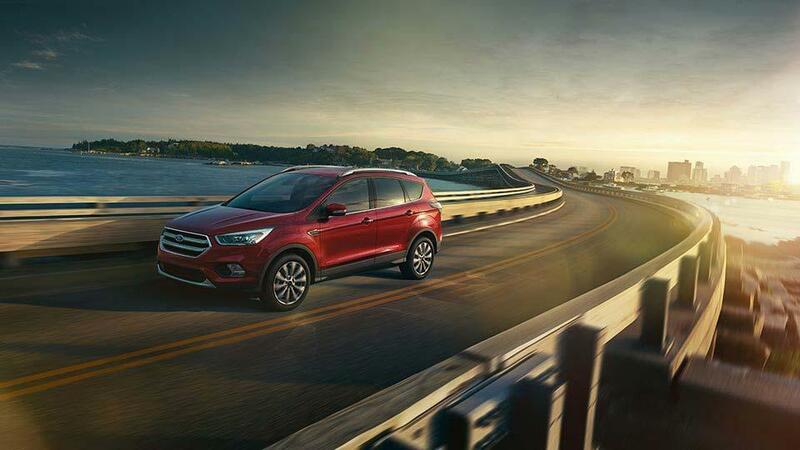 The new Escape also features driver-assist technologies such as adaptive cruise control and collision warning with brake support which uses sensors to detect that you’re approaching a slow-moving vehicle and adjust the cruise control accordingly. There’s lane-keeping assist, which alerts the driver should they drift out of their lane, as well as an active park feature that provides automatic steering assistance to guide the vehicle into a parking spot as well as help escape from tight parallel parking situations. Changes to the 2017 Escape SUV interior begin with a new push-button electronic parking brake that replaces the large hand-actuated parking brake. The gear shifter has been repositioned rearward for improved access to the climate controls in the centre instrument panel. The redesign also includes more functional cup holders, two additional storage bins and a larger center armrest. Inside the media bin at the bottom of the stack is access to a USB port and covered power outlet. Some of the unique features of the SE include cloth-trimmed heated bucket seats, SiriusXM radio, optional Sync3, dual-zone automatic temperate control, fog lights, and an engine block heater. The Titanium model includes many of the leather-trimmed heated front seats with power adjustment, heated, leather-covered steering wheel, Sony audio system with 10 speakers, and Ford’s popular foot-activated hands-free power liftgate. If you need any further convincing, consider this: Ford is the best-selling brand of SUVs in Canada, based on Canadian Vehicle Manufacturers’ Association statistical sales report up to year-end 2016. Even more recently the Ford Escape SUV recorded its best March on record with a sales increase of 12 percent. When Canadians find a vehicle that delivers comfort, reliability, economy, and safety, they vote with their pocketbooks. To view the entire line of 2017 Ford Escape models, come to Merlin Ford in Saskatoon, SK.